I’m going through a mentorship program at my work, and one thing my mentor and I are doing is going through True North by Bill George. The book is about authentic leadership, and it’s great. Even better is the accompanying workbook, which has led me through a series of challenging questions. 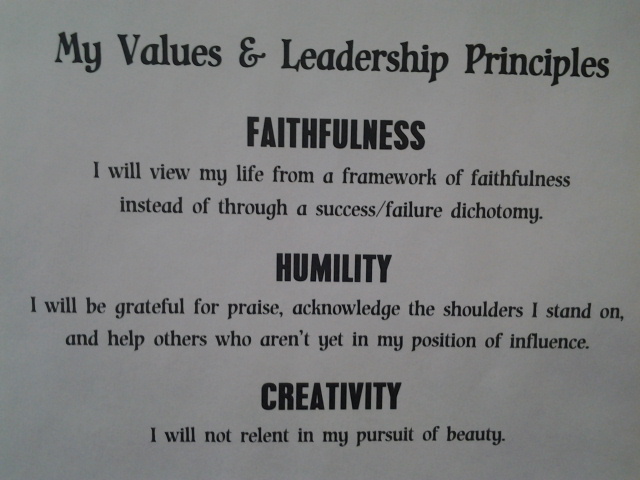 Lately, I had to define my values and, from them, write out my leadership principles. Looking at the list, I realized it was so important to me that I typed them up and posted them in my office. Here’s a pic. Would love your thoughts and to hear your own! This entry was posted in overcoming, real life and tagged authentic leadership, challenging questions, jackie lea sommers leadership principles, jackie lea sommers values, mentorship program, true north by bill george by Jackie Lea Sommers. Bookmark the permalink.